Families looking for a sunshine holiday which combines a tranquil setting with a great location should find that the roomy two-storey Atlas Apartments suit their needs. Everything you'll need for a memorable holiday. We arrived about 8 in the evening at the DonCarlos Hotel and then took about 40 minutes to find the Atlas gateway. It is very easy to miss, down the little path and then a sharp right through the green gates. The apartment have two bedrooms are quite roomy and airy, they are not luxury but you haven't paid for that. They were clean and had everything you need to survive self catering. We basically slept and showered there and spent the rest of the time out. Our case went missing and we got someone else's case from the Don Carlos Hotel, although we returned ours immediately, ours did not get returned until the following day. Maid service was fantastic, cleaned the apartmet and fresh towels every second day. No reception to speak of but the staff at the Don Carlos were brilliant over the case and in general. We used the entertainments there a few nights and the pool once. The pool at Atlas was fine for the kids and it wasn't used that much, loads of beds and only another two families used it. Water a bit cloudy but it was well chlorined by day three!!. 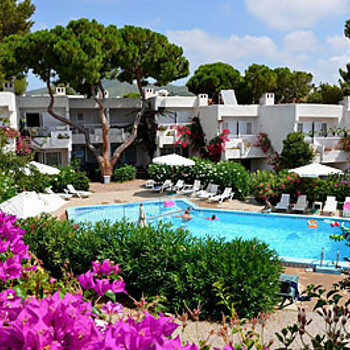 Atlas is fine for easy access to the small beach and Santa Eulalia. The local shops are very, very expensive, please take the 15 minute trip to Euroski instead. Saying that the little shop is fine for lovely fresh bread and milk but nothing else. I would not go back simply because we do not go to the same place every year. If you have a few kids and want to go late season like us, then fine but I can imagine it being a bit of a nightmare in high season. Excellent apartments very clean and spacious. Yet again brilliant maid service with loads of towels and a clean every few days. Entertainment is zilch except a pool table, air hockey and a space invaders type machine in the reception are. We like some others spent a lot of time at the Don Carlos. The pool area got very busy and there was a bit of sun bed hogging going on in the mornings. Very Very hot in August! The apartment we were in had exposed electrical wiring next to the fuse box, the top of the toilet cistern was missing and we were overun by ants in the first week. Very clean and excellent maid service every other day with bundles of fresh clean towels. The apartments were obviously booked to maximum occupancy. Reading previous reviews it states there are plenty of sunbeds and adequate sized pool....sorry in August, 30 beds are not enough for what appeared to me to be about 60-80 people. What was really sad were people getting up at sunrise to put their towels on rows of sunbeds reserving them for themselves, their kids and what appeared to be their kids toys AND potential better sunbeds later in the day as the sun moved ! This was while they faffed on with breakfast and whatever else they were up to until noon when they finally turned up to use the beds. You people just dont know how lucky you were that I didnt throw your towels in the pool. Oh, and a lot of us at the apartments thought you were sad as well. The swimming pool has no life guard and is unsupervised. There is a no diving and no glasses round the pool rule which was broken every day. Older teenage kids and adults bombing and diving into the pool (some adults drinking sangria and beer in glasses in the afternoon). Not good when your younger kids are in arm bands learning to swim........As a mother I couldnt relax and some people just dont think about the possible consequences. People were also smoking around the pool and flicking ash and fag ends on the floor for my kids to walk through...thanks a lot. We ended up going to the Don Carlos most days where there were plenty of sunbeds and tables to sit and relax and activities for the kids. A kids mini disco and entertainment in the evening was enough to see us through the whole holiday. The swimming pool is huge and staffed by a professional life guard with strict rules regard behaviour. To clarify, now the Thomsons welcome meetings have ended the little arrangement to use the Don Carlos facilities next door appears to be even less advertised. If everyone turned up at the hotel from the Atlas en mass it wouldnt work....maybe out of season but not in August because it is very busy especially the kids activites. Hint, dont tell anyone, dont ask anyone, just pop into the hotel go straight to the pool area and relax. They dont mind whos money is filling their till at the bar. We were made to feel very welcome by both staff and guests at the Don Carlos and they knew we were from the Atlas. I also think it depends on how well behaved your kids are from what I have been told !!! Shopping for food has to be what has been described as the 'eroskipi' supermarket in other reviews. This is actually called the 'eroski' and is located up on the main road about 200 yards from the fountain (turn left just before the fountain on the sea front. We managed to get the total holiday shopping from here to feed 5 of us for approx 200 euros. That included booze as well. You'll need a taxi if you are doing it in one go which is about 5 euros from the town square 100yards away. The bottled water here is the cheapest in town! We didnt even use the Spar and Samovar locally in Siesta. The prices were ridiculous, at least 100% mark up on most goods. Beaches - Mariners is manky and to be avoided at all costs! As described, cars parked on the beach, oil and sewage. Some parents were letting their kids bathe near the river mouth, they may as well have been swimming in a sewage treatment plant. Next beach along was okay and it was too hot to walk to the one at the marina side. We used the beach behind the Palladium and Don Carlos Hotel. There is also a small secluded beach right at the end of the road (leave Atlas turn right and go straight ahead) you cant miss it, its only about 15 metres of sand if that, but never used. Snorkelling was great according to my husband, but curtailed by a swarm of small nasty pink jelly fish that arrived in our last few days. Eating out - LA PAELLA, very good service and excellent food...mexican kebabs were a big hit! - SAMOVAR - Pricey evening menu but great for lunchtime snacks. MELS PLACE - This is an advertised English Snack Bar on the sea front just past the Indian restaurant. Avoid!! The owner appears to have two dogs that wander freely through the restaurant and the bar, they are scabby horrible things that appear to be suffering from mange! I nearly pewked after eating my meal then seeing the waiter bend down, stroke the dogs, let his hands be licked by the dogs then serve food and drinks to other customers without washing his hands! It was too late by then and this is probably why I later spent that evening lying on the bathroom floor with horrendous stomach cramps and vomiting along with the rest of my family. Be warned. RESTAURANT ROW - Over rated tourist rip off. KFC / PIZZA HUT - Kids loved it and good value. The resort itself was absoluteley lovely. Other reviewers have mentioned loads of dog mess. Maybe it is seasonal but we did not see any at all in Siesta or on the front (except outside Mels Place mentioned above). The resort was exceptionally clean whilst we were there. I would definitely go back to the Atlas Apartments again because they are such good value and very clean, you cant pick and choose who else are there at the same time though! The resort is gorgeous and I think we might book again, but not at peak season - possibly may june sep oct.
We were in the balaerics last october and to me there was not much difference in the weather between Aug and Oct at all. Not worth the extra pennies anyway. Very large 2 story Apts in a quiet location.A little shabby and could do with air con but the amount of space made up for that. Ground floor sitting room, raised dining area, kitchen, w.c. and patio. Upstairs 2 beds and bathroom, plus balcony. Pool serves 16 apartments and was never crowded and no shortage of sunbeds. Zero entertainment on site, but kids made their own and made lots of friends. Quite a walk into town.